Le peuple migrate It is my first time to watch documentary film,I used to think this kind of film are always boring,but it's really worthwhile to spend two hours.It is not so much a documentary film as sensory feast.What it brings to us is as beautiful as poem,ocean、mountains,iceberg,snow……,they are all the sound of our fantastic nature.No famous actors ， actresses or gorgeous bgm in this film,but every natural creature plays their unique role. At the beginning,a question occurred to me that how did this film make? It is really an amazing feeling,i felt as if i was one of these birds.The director carried us closer to the birds,deep into their soul,made us strongly come up with the idea to touch them again and again.There are many amazing moments in this film,what impressed me most were two scenes.One is a bird opened the lock by himself,another is that the birds were shooted by the hunters.Human beings always think we are the most intelligent creature in this planet. The first one let me feel birds have the same intelligence as human，although i have known this point already, but it's the first time i saw this theory come in to practice. 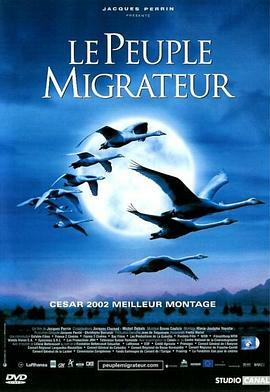 This movie not only shows the beautiful scenery of nature and birds,but also reveal the relationship between human and nature from many aspects.At the beginning of this movie,a little boy helped to cut the rope off to let the bird go,in the end, one year later,the bird came back to see the little boy.I think this is the meaning of promise.On the other hand,human hunt the birds and pollute the environment,which cause them into a dangerous situation.The special technique the director use made me stand in birds' position,intensively feel the desperation when they standed in the polluted water,wanting to have a rest during the long migration.Besides,there are also many warm and cute moments between these birds made me feel touched.Persistence,dream,warmness,sadness,hormone are all combined in this movie. At last,thanks for the director,it's really not easy to make this amazing masterpiece.Thanks for the school library for recommending such a wonderful movie.